AP Inter Supplementary exams hall tickets 2019, AP Inter 1st year Supplementary exams hall tickets, AP Inter 2nd year Supplementary exams hall tickets, AP IPASE May/June Hall tickets download, BIEAP.CGG.GOV.IN Supplementary exams Hall tickets: Board of Intermediate, AP had announced the Time Table for the conduct of Intermediate Public Advanced Supplementary Examinations, May/June 2019 pertaining to General Courses . It will be also available in the Board of Intermediate Education Website www.bieap.gov.in. The First year examination will be held from 9.00 AM to 12.00 Noon in Fore Noon session and Second year examination from 2.30 PM to 5.30 PM in After Noon session from 14-05-2019 to 22-05-2019 every day. The Practical Examinations will be conducted from 23-05-2019 to 27-05-2019in two spells i.e. from 9.00 A.M to 12.00 P.M and 2.00 P.M to 5.00 P.M (Including Sunday on 28-05-2019). Ethics and Human Values Examination will be conducted on 28-05-2019 (One day) from 10.00 AM to 1.00 P.M. The Environmental Education Examination will be conducted on 29-05-2019 from 10.00 A.M to 1.00 P.M (One day). AP Intermediate 1st & 2nd Year Supplementary Hall Tickets 2019 Download @ bieap.cgg.gov.in, Students of inter 1st and 2nd year can go visit the official website of BIEAP and download their admit cards. Students need to be aware of the fact that the hall tickets will only be held for download in the official website of BIEAP. The official website of the board to download hall tickets is bieap.gov.in. AP Inter 1st and 2nd Year Supply Exam Hall Tickets Released, download IPASE Admit Cards Now from bieap.cg.gov.in : Andhra Pradesh Inter 1st and 2nd Year Supply Exam Hall Tickets have been released at the official website. Aspirants will be need to download IPASE Admit Cards now at bieap.cg.gov.in. 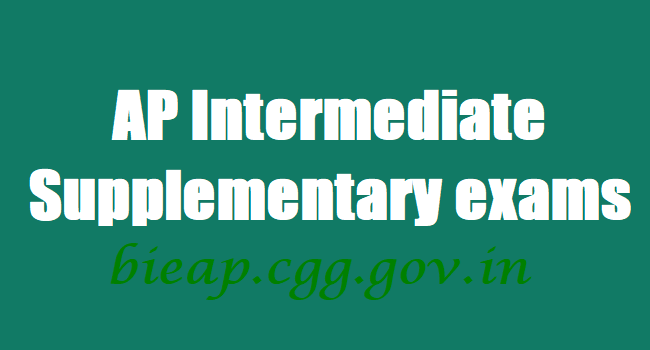 The students will need to appear for the BIEAP board AP Inter supplementary exams 2019 PDF; as per that the supply examinations from May 14 to May 22. The AP Inter 1st and 2nd Year Supply practical examinations will be held from May 23 to May 27; the ethics and women values examination will be held on 28th May and Environmental Education Examination will be held on May 29.